What is your greatest concern in a construction project? Is it the complicated design, the material waste or the lack of highly-skilled welders? Today’s challenges in steel construction are mostly related to looking for ways to accomplish high quality results in shorter time frames. Finding highly-skilled personnel, such as experienced welders, is also becoming an issue. Automating the cutting process solves those challenges by providing highly accurate cuts and reducing significantly the weld volume. Highly accurate cuts means no need for excessive grinding and parts prepared for easy fitting and welding. Material types and volume differ greatly from project to project. The solution to having machines at idle in the workshop is to have one multipurpose machine instead, capable of cutting multiple profiles. The HGG multi-profile cutting machines can cut pipes, box sections and flat bars, thus combining the cutting capability of three machines into a single one. 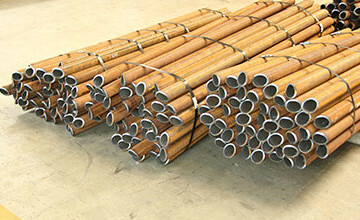 Volumes and pipe sizes differ from project to project and demand high level of flexibility from your workforce. HGG’s market leading steel cutting machines are automating and simplifying the way fabricators are managing the large volumes of steel passing through the workshop. By using traditional methods a fabricator is able to cut only 10-20 tons of pipe per day. 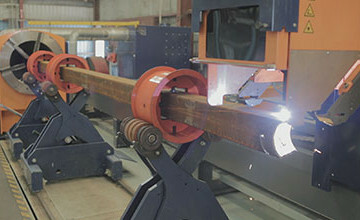 With the HGG pipe and tube cutting services this can be increased to up to 100 tons a day.